After purchasing the Crucible Guard box set, I found myself in possession of two heavy warjacks – the Suppressor and Vindicator. I quickly purchased three heavy kits, and found myself with some decisions. Should I magnetize, or build a specific jack with each kit? I decided to build specific jacks. Magnetizing is totally possible, but I want to do something unique with this faction’s paint scheme. Building specific jacks means another decision point: which jacks? I opted to build the Suppressor and Vindicator from the army box and finish off with another Vindicator followed by two Suppressors. The expense and utility of the Suppressor vs the expense of the Vindicator mean I’m more likely to run three Suppressors as opposed to three Vindicators. Why build only Suppressors and Vindicators with my five heavy warjack bodies? Because I have extra Ironclad bodies just waiting for a reason to assemble. Nothing says they have to be assembled with Ironclad parts, right? Ironclads laid out with Suppressor and Vindicator chassis nearby. The three Ironclads, black, blue, grey, come from different kits. The blue is from a starter, grey from an actual heavy kit, and black from a long time ago. The first issue with Ironclads is that the stacks are in a V shape, while the Crucible Guard have a set of four stacks in a two by two pattern. So the stacks get clipped with a pair of snips and knife. A sharp eye would notice the group of blue stacks in front of the grey Crucible Guard chassis. Two of those came from the Ironclad, and a second set came from the starter set’s Lancer. That’s another jack of which I have enough previously constructed. The Lancer kit’s stacks are already joined, so a little bit of glue fixes them all together. I glued them upside down, so that the top of the stacks were flush with the table. Then I filed down the bottoms of the stacks in a curved shape so they’d fit the Ironclad chassis somewhat closely. Stacks joined and prepped for assembly. Additionally, the little bumpy things on the shoulder pads absolutely needed to go. In the picture above, they are noticeably gone. A file and some sandpaper quickly flattened and smoothed the shoulder pads. Stacks attached to Crucible Guard for comparison. The stacks on the Crucible Guard models attach easily, but the Toro conversions will take a bit more work. Before gluing the stacks, I went ahead and sanded off the bumps from shoulder pads on all the Ironclads. The Toro heads fit perfectly in the Ironclad chassis. Ironclads looking more like Toros. Looking “a-head”, we’ll attach the stacks! Arms and swords attach easily. They attach even easier if the end with the bump is flattened or a small hole is drilled in the arm bulge (it isn’t really a socket, so…). They also got their legs attached! 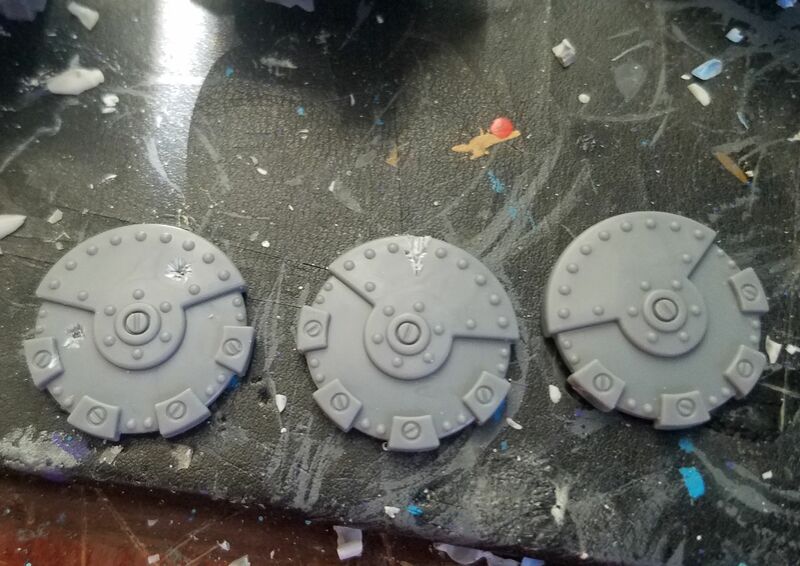 The background for my Toro warjacks is that the Crucible Guard’s weapon development team was working on an Ironclad upgrade to sell to the Cygnar army. The price was a little out of range, and the new jack couldn’t compete with the new Avenger/Hammersmith/Centurion chassis, so the Crucible Guard was left with a bunch of experimental Toro Chassis. Rather than waste the jacks, they sold them to mercenaries and Llaelese holdouts. Occasionally, these veteran jacks find their way back into the Crucible Guard inventory. Due to their frequent use, these Toros have a bit of battle damage, starting with the most obvious place – their shields. Shields with some sizeable bullet holes. Are they really holes if they don’t penetrate the shield? Check out the angry jacks. And because we need to vent some smoke, the stacks get green-stuffed onto the chassis. And there we go. These guys look pretty good, and I can’t wait to put them on a table. Three sets of Toro heads and arms. Three heavy Ironclad kits, minus the heads and arms. Three sets of Lancer or Charger stacks. Glue (I like Gorilla Glue).